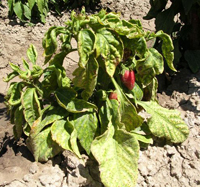 The Beet Curly Top Virus Control Program's (BCTVCP) objective is to reduce the incidence of beet curly top virus (BCTV) infection in susceptible crops below a level of economic importance, through the use of integrated pest management techniques. 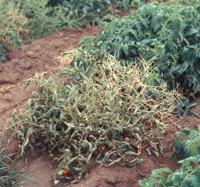 BCTV is an extremely serious plant virus affecting several hundred varieties of ornamental and commercial crops in California. The Beet Curly Top Virus Control Board (BCTVCB) advises the Secretary on this Program. The only known vector of this virus is the sugar beet leafhopper (BLH), Circulifer tenellus (Baker). The BLH is an introduced pest and migratory by nature. Populations develop in selected habitats within the San Joaquin, Imperial, Sacramento and Coastal Valleys of California as well as moving into California from contiguous states and Mexico. The Program utilizes intensive surveys to locate and monitor BLH populations throughout the year. As much as 100,000 acres of rangeland and idle agricultural lands are treated annually to control breeding BLH populations on a variety of host plants prior to the migration of adult leafhoppers into susceptible crops. Winter, spring and fall treatment periods coincide with the reproductive biology of BLH.